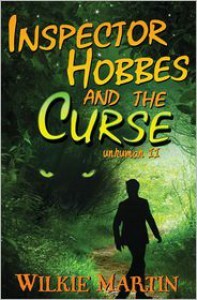 I received a copy of Inspector Hobbes and the Curse from the publisher via netgalley in return for an honest review. I haven't read the previous book, but this one really reads fine as a stand alone novel. Inspector Hobbes and the Curse is very much the funny mans Sherlock Holmes, it's a light hearted tale full of mystery, quirks and puns. The tale is told from the character Andy Caplets point of view, poor Andy, he's accident prone and as a result is left jobless, broke and homeless. He's taken in by Inspector Hobbes and takes on the role of a somewhat bumbling Watson to Hobbes's Holmes and together they set out to solve an unusual supernatural whodunit mystery. This was a fun read and is full of chuckle worthy puns and word play. I wouldn't say it was a page turner it's more one of those books you can pick up and read without having to think too much about the plot and just enjoy the humour and the tale.